Yesterday I bought the boys a package of low cut socks for the warm weather that I keep hoping will arrive. The boys are only one shoe size apart from each other so they can wear the same size socks. I hear you thinking. Has Shoes lost her mind? Has she cracked up and thinks that writing about newly purchased little boy socks is worthy of mention? Well no, I haven’t, but yes I do. This morning while Cody was enjoying some computer time and Carter was sleeping in, I busted into the sock pack, stretched one, pinched it to test its softness and declared them worthy of my boys feet. Then I threw them in a pile on the end of the bed to later add to the dirty laundry hamper (what can I say, it was morning and I was feeling lazy.) It was at that moment that Carter woke up and with eyes half closed, hair tousled, and smelling like sweaty sleepy boy he came stumbling towards me for morning hugs. Total mind blow, I know! For it was at that moment that I discovered Big Industry had been messing with our minds for all these years. Our washers and dryers have been wrongfully accused of misplacing, and yes sometimes even eating, socks leaving us standing there frustrated and confused holding an odd number of socks. So to Lola and Ken, I am sorry. I hope you can forgive me for the bad thoughts I have had towards you all these years. I realize now that all those little boys socks that have gone missing have really been here all along. There have always been odd socks; there was not one less but one more. 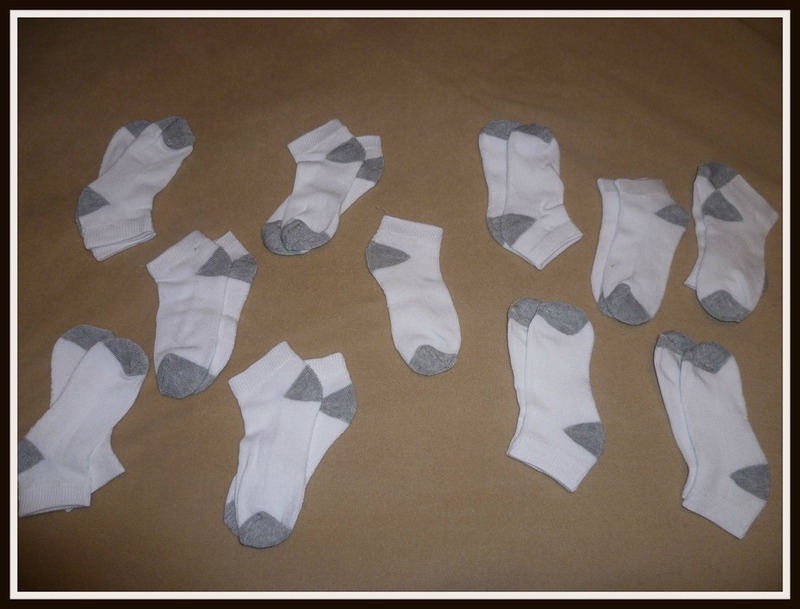 Oh, and thank you kindly Cherokee sock company for teaching my son that ten pairs of socks equals twenty-one. This entry was posted in Little Feet and tagged Children, Family, Kids, Laundry, Life, Missing socks, Parenting, Socks. Bookmark the permalink. They do that on purpose so you have to buy more! You’ll always think one is missing. Like 12 hotdogs in a package and only 8 buns come in a package. It is all a conspiracy. Exactly! Trust no one, especially the makers of hot dogs and socks. I thought it was worthy and I am glad you think so too. It is cracked wide open, there is no way they can get away with this mad odd sock thing any longer. I put my foot down! I know, it is crazy the things those big companies try to get away with. Well they can no longer get away with evil sock crimes against humanity any longer! Hehehe, glad you liked it. I’m sure Lola and Ken say, “Hmph.” Thanks for clearing that up. They are demanding time off and a plaque reading “Number of Days With Missing Socks: 0” I told them they will get time off, but my fingers were crossed behind my back. Great post. Thanks for solving that mystery, I am missing one of my favorite socks…..It’s blue and green striped..have your seen it? Blue and green striped, I think it was stuck to the back of my sweater last winter and since I could not find the match, I threw it away. Perhaps we need to start a Missing Sock photo on the back of milk cartons to keep this from happening again. Love this. Whenever I am folding laundry and I somehow end up with no missing socks, hubby can’t believe it. All these years I blamed the washer and dryer……I never count the socks before washing, but not that you’ve cracked the code you can be sure I’m on that bus!! I will be sock counting from now on. Great post! !